SCVHistory.com JD7901 | Mentryville | Jo Anne Darcy Serves Punch at Historical Society Event, 12-9-1979. 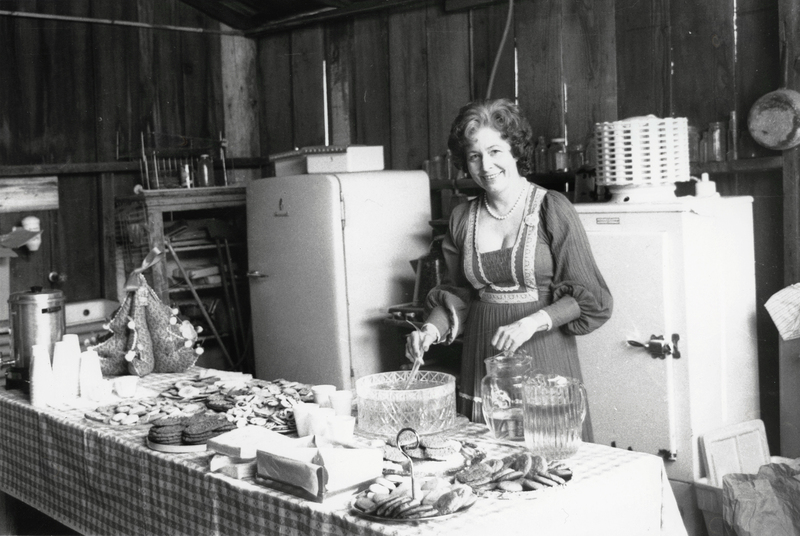 December 9, 1979 — Jo Anne Darcy, then-executive director of the Newhall-Saugus-Valencia Chamber of Commerce, is decked out in what she termed "old time gear" as she serves punch and desserts during an SCV Historical Society membership drive in the Pico Canyon oil town of Mentryville. This photograph, and the photo below, may have been shot by her husband, Curtis Darcy, who shot other photos relating to Jo Anne's historic preservation work. 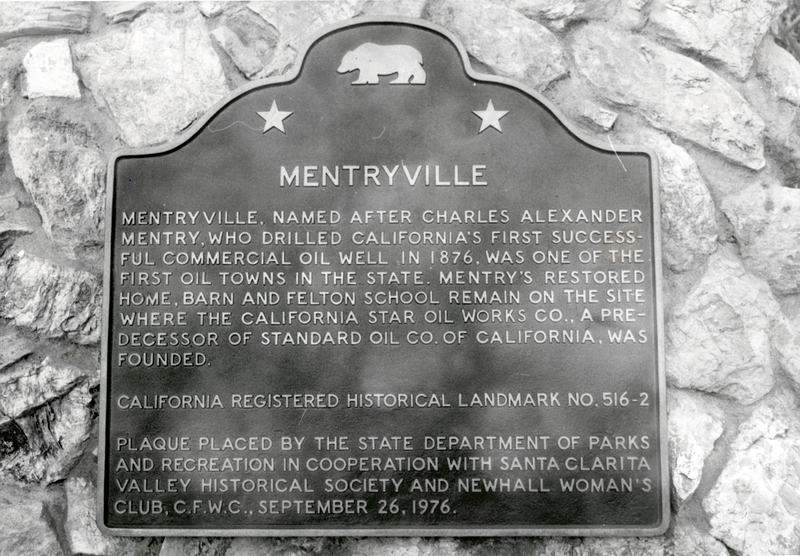 California Historic Landmark plaque at Mentryville, as seen December 9, 1979. The Signal | November 28, 1979. 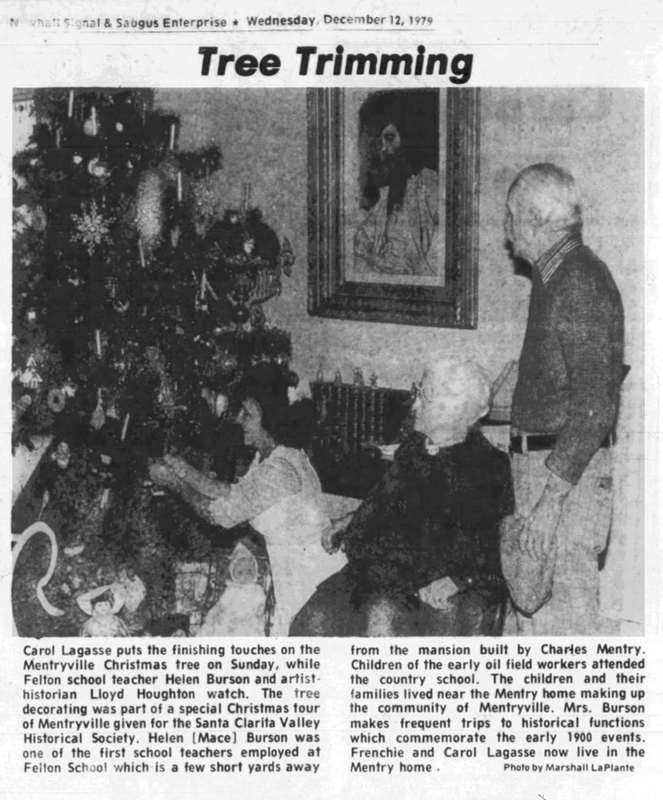 The spirit of Christmas past will be relived in a tour of Mentryville this Sunday. The Santa Ciarita Valley Society members will visit the pioneer oil town of Mentryville (California Landmark #516-2) from 1:30 to 3 p.m. The tour, offered by Society members Carol and Frenchy Lagasse. will include the old restored red and white barn, the one-room school house, and the Alex Mentry home, furnished with period furniture. The costumed docents will be on hand to help add authenticity to the afternoon to direct members up Pico Canyon to view California's first oil well (Pico #4). This tour is open only to members of the Santa Ciarita Valley Historical Society with 1980 dues cards, as this event marks the beginning of the 1980 membership drive. Members are requested to make reservations with Carol Lagasse, 259-4944, Helen Spencer, 259-7685, or with president Cynthia Neal-Harris, 251-4718. Memberships may be acquired at the gate of Mentryville on Sunday, but it is imperative that reservations be made so that the Society can make plans. The host, Frenchy Lagasse, said that the tour is to be held in fair weather only. Membership dues of $5 may also be paid at the Newhall-Saugus-Valencia Chamber of Commerce, 24275 Walnut Street, Newhall; The Signal. 22504 6th Street, Newhall: the Canyon Country Chamber of Commerce, 19333 Soledad Canyon Road. Canyon Country; or by mailing a check for $5 eact to the Santa Ciarita Valley Historical Society, Membership Committee. P.O. Box 875, Newhall, California, 91322. Alex Mentry never realized that his home in Pico Canyon would become famous as California's pioneer oil town (California Landmark 4516-2). All that remains today of Mentryville are Mentry's Victorian period home, the barn, and the quaint one room school house, named for Senator Felton. These buildings have been restored with the loving care of Carol and Frenchy Lagasse. The Lagasses will open the historical buildings and offer views of California's first oil well (Pico #4 of national landmark recognition) for a tour sponsored by the Santa Ciarita Valley Historical as a 1980 membership drive. The grounds are usually closed to the public, and this rare opportunity to view authentic period furnishings in the Mentry home, decorated for Christmas, will be available on Sunday December 9, 1:30 to 3 p.m., to members of the Santa Ciarita Valley Historical Society with 1980 membership cards only. Memberships of $5 each may be paid at the New-hall-Saugus-Valencia Chamber of Commerce, 24275 Walnut Street, Newhall: The Signal, 22504 6th Street, Newhall; or by mailing the dues to S.C.V. Historical Society, P.O. Box 875, Newhall. Membership may also be acquired at the gate of Mentryville on December 9, but reservations must be made with Carol Lagasse 259-4944, Helen Spencer 259-7685, or Cynthia Neal-Harris 251-4718, president. JD7901, JD7901b: 9600 dpi jpeg from Jo Anne Darcy Collection.